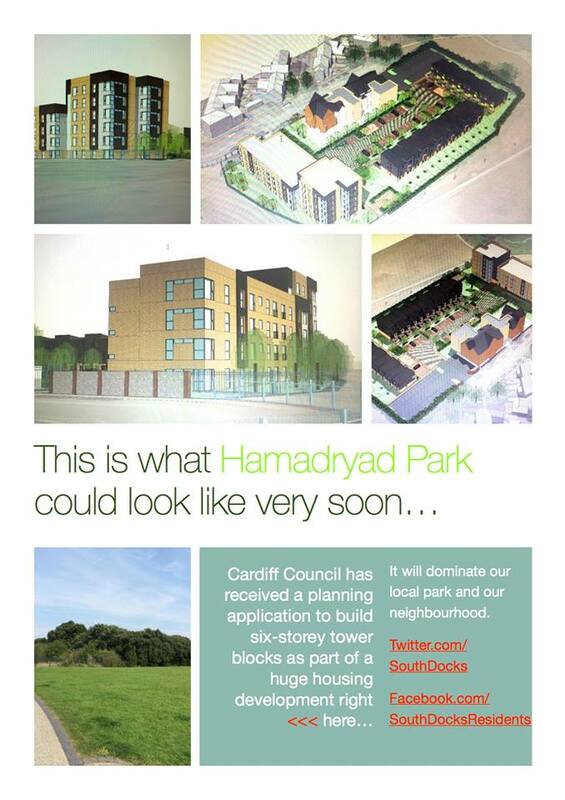 There comes a time in every active citizen’s life when you live in a place you quite like, and then someone comes along and wants to build on some lovely green space near your house, vomiting up 70 new identikit flats, because everyone knows that what Cardiff Bay REALLY needs is MORE FLATS. Okay, I’m a little biased – this proposed development is happening within a couple of hundred metres of my house, but still. If you’ve been to the old docks area within the past ten years, you’ll probably agree that the last thing this part of Cardiff needs is more flats, amirite? Planning application 14/02077/DCI is proposing 75 new dwellings on an area that’s currently populated with trees that have preservation orders on them, and also would destroy an area currently used as foraging for the local bat population. The space is also an extra green belt between the A4232 and the local residential area. If you, like me, are getting to the end of their patience with applications like this, please support this cause! 1. Write a letter saying you object to Planning Application 14/02077/DCI. The closing date for applications is THURSDAY 16 OCTOBER, so GET YOUR OBJECTIONS IN (please). It’s really important that AS MANY PEOPLE AS POSSIBLE write in to the council to object to this proposal – without the voice of the community, this horrendous scheme could go ahead. For any active citizens in the Butetown / Grangetown area (or even further away – please help your neighbours!) you can join the South Docks Facebook group, which has been set up to help fight this planning application. There was a residents meeting last night, which was attended by Media Wales and BBC journalists, as well as local councillor Ali Ahmed and National Assembly for Wales Member Eluned Parrott (who pledged her support to the objection). SUPPORT THE CAUSE! SEND IN YOUR OBJECTIONS BY OCTOBER 16! It only needs to be an email. COME ON FOLKS!